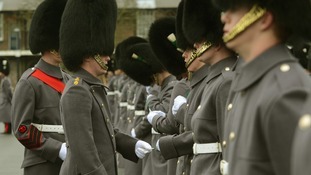 Eight hundred leeks have been presented to soldiers and friends of the Welsh Guards in a St David’s Day ceremony. According to ancient legend, King Cadwaladr of Gwynedd ordered his soldiers to identify themselves by wearing the vegetable on their helmets in a sixth-century battle against the Saxons that took place in a leek field. The Prince of Wales and Duchess of Cornwall are in Wales for a series of celebrations to mark St David's Day. This morning they attended the national St David's Day service at St John the Baptist City Parish Church and will shortly visit the Royal College of Music and Drama. In his St. David's Day message, Opposition leader Andrew RT Davies says it's important that Wales looks back and looks forward. St David’s Day will always remain a hugely significant part of Welsh culture and I hope as many people as possible find time to celebrate it. We have a country of which to be immensely proud and as well as remembering our heritage today, we should also look to our future. Assembly support for our bank holiday and honours system proposals this week was extremely welcome. We believe the contributions of people from all walks of life should be celebrated. In Wales and by Wales. While the newly announced St David Awards go some way to achieving this, it is crucial that they are independent of government. We need a system which reflects and demonstrates honour bestowed by the Welsh nation and I hope – with consensus clearly emerging – this can be discussed further. In his St. David's Day message, Welsh Secretary David Jones says Wales' two governments must continue to work together so that the country can 'achieve its maximum potential. As Secretary of State for Wales, I am delighted to deliver my first St David’s Day greeting, and to send my warmest wishes to everyone celebrating our national day at home and around the world. Devolution means that Wales has two Governments - in Westminster and in Cardiff. Whilst there are certainly political differences between our two administrations, I believe that the First Minister and I are agreed that the interests of the people of Wales are best served by working together as closely as possible. Over the last few months, I have sharpened the focus of the Wales Office, to ensure that economic growth is at the heart of all we do. Key to growth is the improvement of Wales's infrastructure, which has suffered from under-investment over many decades. Our announcement last year of the electrification of the Great Western rail line to Swansea is a clear indication of our intent to improve Welsh infrastructure. Now we are working on the business case for upgrading the North Wales coast line and are determined to continue the roll-out of superfast broadband throughout Wales. Every one of us who lives in Wales has, I believe, good reason to feel proud of our uniquely beautiful homeland. It has a rich and illustrious history and, with some hard work from us all, the promise of a better, more prosperous future. I wish you all a happy St David’s Day. Dydd G?yl Dewi hapus i bawb.